“The Problem We All Live With,” Norman Rockwell, 1963 Oil on canvas, 36″ x 58″ Illustration for “Look,” January 14, 1964 Licensed by Norman Rockwell Licensing, Niles, IL. 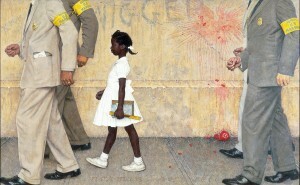 From the permanent collection of Norman Rockwell Museum. storyteller; such classic paintings as No Swimming, Going and Coming, The Art Critic, and The Problem We All Live With will be on view at the Norman Rockwell Museum through Columbus Day, October 11, before opening at The North Carolina Museum of Art on November 6, 2010.
long-time supporter of civil rights, The Problem We All Live With ushered in a new era in Rockwell’s career, where he directly tackled more social and political themes while retaining his usual optimistic outlook on American society.